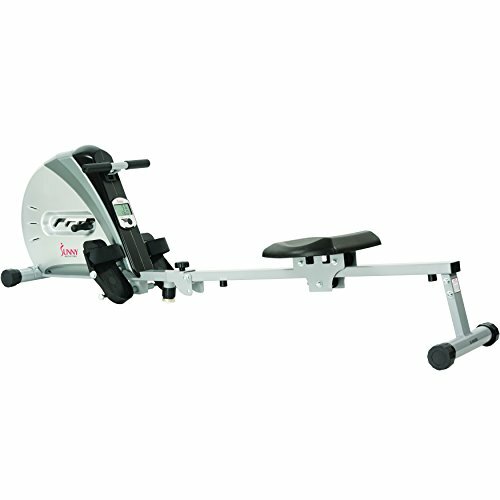 The Sunny Health & Fitness SF-RW5606 elastic cord rowing machine provides outstanding way to increase fitness by burning calories and building muscle in a safe, low-impact way. Made of top grade steel, this ultra smooth and quiet rower features an elastic cord resistance with 4 levels of adjustable tension which makes it the perfect addition to your home gym. It comes equipped with large any-slip pedals with straps and an easy to read LCD monitor which displays time, calories burned, count, total count, count per minute and scan. Featuring the option to fold; the Sunny Health & Fitness elastic cord rowing machine is very portable and it can easily be stored away. Maximum user weight 220lbs.